The TexAnns performed in front of the largest crowd in Wisdom Gym history, and they did not disappoint. 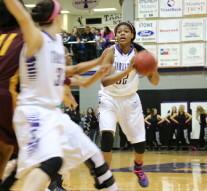 They beat Midwestern State in an overtime classic and Kiara Wright shined when they needed her most. Neither team enjoyed much of a lead during the entire game; there were 20 lead changes. The TexAnns took a 30-27 lead into the locker room at half time and came out with a 16-11 run to stretch the lead to 8 at a score of 46-38. With just over 5 minutes left in the game, MSU was able string together an 8-1 run to go up on the TexAnns 56-54 and that was when the fun really began. The teams traded the lead as the game wound down and were tied with just over 2 minutes left. Senior Brianna Bledsoe hit a pair of free throws that would put Tarleton up 2 but that was the last lead they would have in regulation. MSU was able to score as the time wound down. The TexAnns were able to get a shot up at the buzzer and the shot wasn’t far off, but it missed. Less than two minutes into overtime and the TexAnns lost another starter to fouls, Bledsoe was the second highest scorer for the TexAnns but she wouldn’t be in the game at the end. Then Kiara Wright went to work and really impressed the crowd. Wright had two layups in a row to put the TexAnns up 73-72 and then was fouled after getting the defensive rebound on the other end. She made the first shot then missed the second and she was able to get her own rebound, resulting in being fouled again.Wright made the next two to put the TexAnns up 76-72. 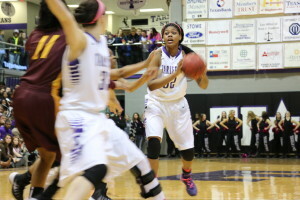 Kiara Wright wowed a sold out Wisdom Gym with 35 points and 21 rebounds. The game still wasn’t over however because Midwestern State scored and was fouled on the next play; they made the foul shot and were only down one. Meagan O’Dell was fouled right away by MSU and she made both her free throws making the final score 78-75. Kiara Wright had her 51st career double double with a ridiculous 35 points and 21 rebounds. One of Wright’s biggest rebounds was her own in overtime, that showed her will to win. This is familiar territory for Wright, she has now had two 30 point and 20 rebound plus games. For her to be able to perform this way in front of the biggest crowd in the history of Wisdom Gym was really something special. The TexAnns go out of state now to play Cameron in Lawton, Oklahoma. The game against Cameron tips at 2 p.m. on Saturday.